Jon Athan: Writing Updates for July 2015 + Book Sale! Writing Updates for July 2015 + Book Sale! 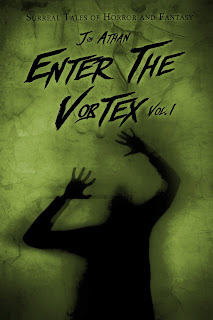 First and foremost, thank you for supporting Enter The Vortex Vol. 1: Surreal Tales of Horror and Fantasy last week! Like all of my work, it was a sincere work of passion. I truly hope you enjoyed the strange and terrifying stories. I also hope you're also ready for more! Enter The Vortex Vol. 2 is currently in the proofreading process! After a few more minor edits, the book will be ready for release. This new installment is two times longer than Volume 1. So, the book will have ten uniquely terrifying short stories. You can expect chilling urban legends, psychic powers, time travel, doppelgangers, endless elevators, and much more. The book should be available by August 1, 2015. Keep your eyes peeled for the official announcement. From July 10th to the 17th, UK readers will be able to participate in an exclusive sale. Restless Nightmares Vol. 2 will be available for £0.99. Restless Nightmares Vol. 3 will also be available for £0.99. These steep 50% discounts will only be available for a week, so please don't hesitate! Once again, thank you for the support. I truly appreciate your readership — it is invaluable. I hope I can continue to entertain for as long as possible. I'll have a formal announcement for the next book very soon. Please support! Buy it now for $0.99! Enter The Vortex Vol. 2 coming August 1st, 2015!